Situated in 600 acres of farmland and rugged natural vistas, the setting for this project can only be described as majestic. The brief was bold and combined the renovation of an existing edifice with the addition of new buildings to create a superlative accommodation offering. The stunning rural location, close to the Scottish border, necessitated an exceptionally sympathetic approach to design. The pre-existing stone structure was to be extended with a series of new buildings in a “wrap-around” style to create a courtyard feel. The existing building had a barn style appearance and it was important that the new buildings, whilst contemporary, were sympathetic to and blended with their surroundings. 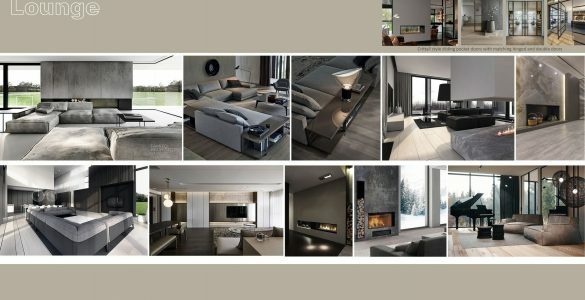 To create an open plan, sociable living areas, populated with the most incredible abundance of ‘toys’ of any project to date, to include a ‘Heineken Room’, a rotating climbing wall, a flotation tank room, plunge pool, outdoor natural pool and an indoor pool to mention just a few. To orientate the accommodation to maximise views whilst complementing the precedent character of the existing building as well as the landscape and environment. Design by UBER were commissioned to provide the space planning for the project. 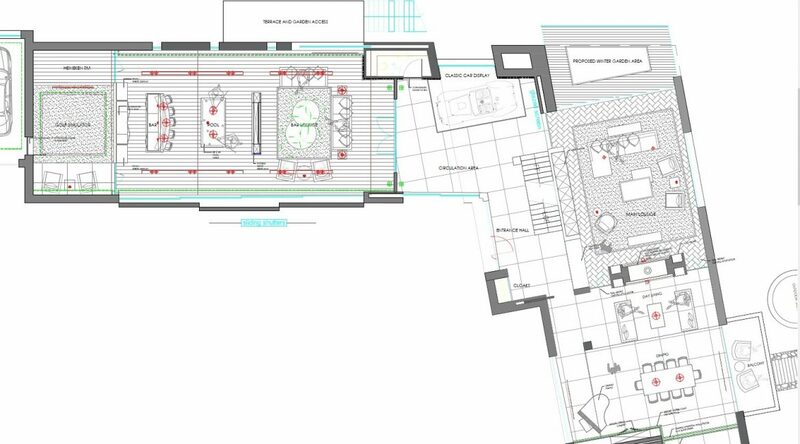 A comprehensive site analysis and outline plans were provided by Sadler Brown Architecture. In the case of the house at Bonchester Bridge it was imperative that every design facet was sympathetic to the environment. How this was to be addressed was critical to the entire project – the buildings were to complement existing local architecture which was, in the main, of a functional agricultural ilk. To this end the focus was on shapes with overhangs, pitched roofs, linear forms and vertical timber cladding. The aim was to use materials familiar to the local architectural palette but with a contemporary slant. For example, wide aspect shou sugi ban timber cladding; naturally weathered larch narrow aspect cladding and louvred cladding would all be used to complement the predominantly timber local agricultural buildings. Another key element of this project was to highlight and maximise the views. We utilised bronze glazing throughout the scheme both internally and externally. This has the dual effect of reflecting the spectacular views whilst creating a heightened sense of drama. Whilst this is a predominantly a family home, it is also a property with a clear focus on entertaining and entertainment. As such, the scheme required elements of pure theatre. The entrance hall sets the stage and is designed with a classic car on display on a plinth. 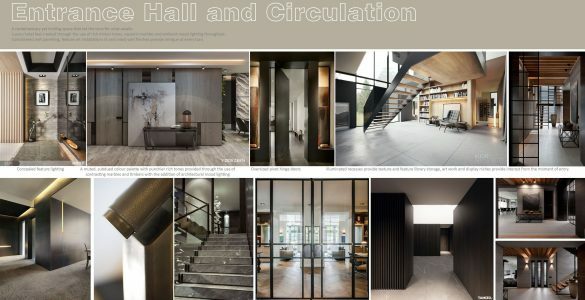 The entrance hall leads to the living accommodation on one side and the entertainment and leisure areas on the other. The living spaces were designed to be sociable, functional, open-plan areas. The main lounge enjoys a high tech media wall, a full height aquarium (with fish and aquatic landscaping chosen to mirror the local scenery) and a double sided log burner with recessed TV niches. Beyond a glazed wall we proposed the addition of a winter garden, creating an outside space which can be used all year round. Back in the lounge Crittall style doors open into the day living area, which is designed to be a less formal area. The day living space flows effortlessly into the dining area which offers drama in spades with full height and width glazed doors to both aspects. We were keen to ensure the house feels akin to an organic part of the landscape. One way in which we achieved this was to utilise materials that are part of the local architectural vernacular within the house. To this end the dining area boasts a reeded timber clad feature wall and a statement piece sliding partition wall into the kitchen in a slate finish. The kitchen is designed to be both a functional and sociable space. A glazed area is cantilevered out from the kitchen. With infinite attention to detail, this area is designed with a day bed as well as sensory dog beds for man’s best friend. Glazed doors open from the kitchen onto a BBQ terrace and kitchen garden. A further glazed door from the kitchen leads into a chic glass link through to the gym area. Highly stylised and perfectly formed, the glazed link has exquisite design credentials, added to which it offers virtually 360 degree views. Fully kitted with strength and performance equipment and a rotating climbing wall, the gym also has its own snug for downtime once workouts are completed. The first floor is designed in understated tones which complement the rural landscape. Atmospheric lighting and textured wall coverings are used to further enhance the feeling of fusion with the environment. A mezzanine galleried landing with glazed void creates a sense of drama. At one end of the building, the master suite boasts a corner glazed aspect which offers panoramic views. Designed in neutral tones throughout, it is a serene space. There are a further four bedroom suites, two of which are entered via secret doors off the mezzanine gallery. One of these has a private balcony with glazed aspects. 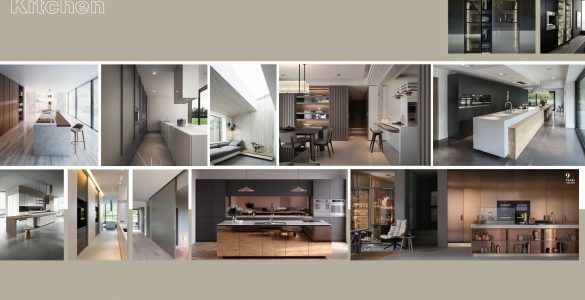 The entertainment and leisure part of the home, whist joined to the living accommodation, is deliberately designed to be a distinct entity. The area is accessed via glazed doors directly from the main entrance hall. They lead into a lounge area with double sided fireplace into the pool table space. Beyond this is the backlit bar complete with wine and spirit displays. The entire entertainment space has glazed sliding doors enabling the space to be completely opened out thus creating a seamless flow between inside and outside space. Moving further on there is a golf simulator and Heineken room as well as a note of drama with a secret door into the three car garage. To add to the full entertainment experience, a bowling alley is positioned behind the main entertainment suite. The lower ground floor, accessed by stairs from the main entrance hall offers a different experience again. This is designed as a more intimate space with a relaxed and calming atmosphere. 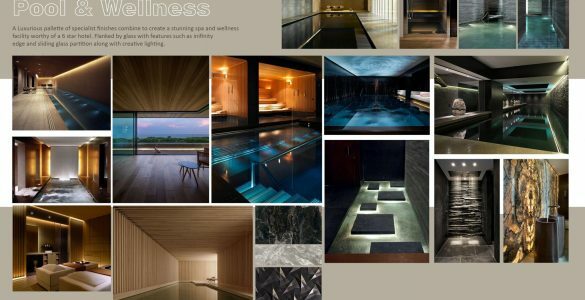 The aim was to create the feeling of a luxury spa experience. This is achieved with double hot tubs, a raised platform suspended over the swimming pool which is furnished with day beds and cinema screen, a sauna, steam room and massage room accessed over underlit stepping stones in a basalt stone. Space was maximised to allow for a salt water floatation tank which features backlit precious stones for the ultimate soothing experience. Tucked away from the pool area is a classically designed cinema room with tiered seating. The house at Bonchester Bridge is a perfect example of designers and architects working together from concept stage, thus turning a good project into an exceptional one. Elevated beyond simple design, this house is a sensory journey. 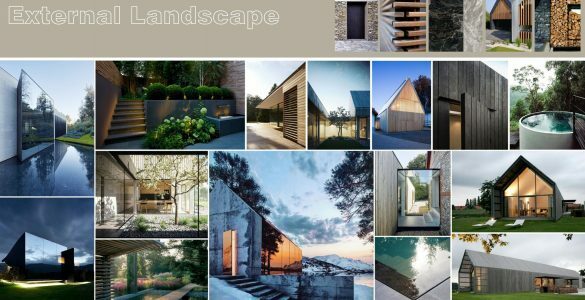 The sharpness of the details together with the creative use of natural finishes and materials creates a unique dichotomy – a contemporary home that fits seamlessly into its landscape and, as such, will remain utterly timeless.